Bear 409 was named "Fattest Bear" at Katmai National Park and Preserve on Tuesday. The Fat Bear Week bracket began with 12 bears and ended with one glorious winner on Tuesday night: 409 Beadnose. Bear 409 at the end of June and at the end of September. Bear 747 at the end of June and at the end of August. The results are in. And this year's winner in Katmai National Park and Reserve's annual "fattest bear" contest is 409 Beadnose. "Her radiant rolls were deemed by the voting public to be this year's most fabulous flab. Our chubby champ has a few more weeks to chow down on lingering salmon carcasses before she heads up the mountains to dig herself a den and savor her victory," the national park posted on Facebook. Katmai National Park, located in southwestern Alaska, declared the winner of its weeklong competition late Tuesday. People could vote on social media on which bear looks to be the fattest in the preserve. This is the fourth year the national park has held the competition. It began with 12 bears and, by process of single elimination, culminated Tuesday in a final face-off of fatness between Bear 409, whom the park described as a "gigantic gal" with a "marvelous muffin top," and Bear 747, a "blimpy boar" whose "belly barely has clearance with the ground." 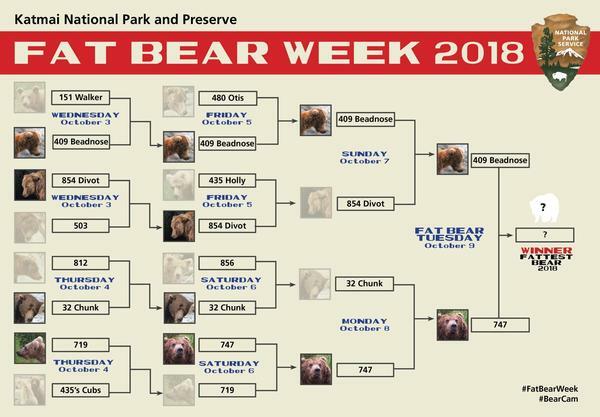 The national park posted photos of bears in head-to-head matchups throughout Fat Bear Week, with the bear whose photo received the most Facebook "likes" advancing to the next round. While voting closed Tuesday night, votes for Bear 409 clocked in at just under 7,000 likes compared with Bear 747's 3,000 likes on Wednesday morning. "All of it is a fun — and it is fun — way to educate people on the struggle for survival that these bears go through and the dramatic changes involved that. They are going to lose about one-third of their body weight over winter hibernation, and in order to survive the next year, they have to gain all of that back, in a few short weeks over the summer," Andrew LaValle, a park ranger at Katmai, told NPR. "As fun and silly as this thing is, there is a serious undertone to it," he said. "They're fishing and eating as much as they are because they have to. It is a game of life and death for them, with serious consequences." 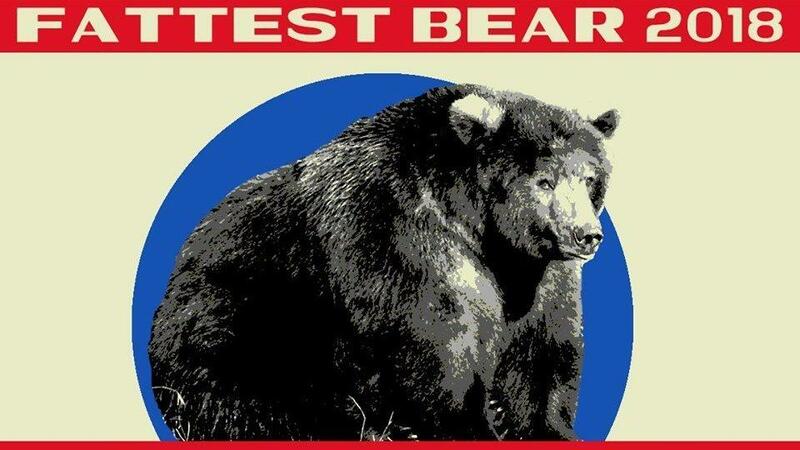 LaValle said they estimate both bears in the Fat Bear Tuesday final to be just over 1,000 pounds, saying 747 might be larger based on the size of his frame. "It is all just estimated — we don't have them step on any scales or anything — so, we can only guess, and that's part of the fun of it," LaValle said. In the end, Bear 409 was crowned the "Fattest Bear." Social media users seemed to concede that 747 was bigger, but they just liked 409's apparent backstory: a single mom trying to make it in the wild. "She deserves it...has had four multiple birth litters and raised her cubs to maturity ! About time a female bear won!" commented Donna Merrick Newton on Facebook. On Twitter, @happeningfish tweeted, "409 raised cubs and STILL put in the work! Yes Queen!" Some voters were staunch in their support. "I would die for bear 409," @EnoikosGes tweeted. While others were more indecisive. "It's so hard! I love 409 but I have to think 747 is fatter!? Too close to call. Do I go with my head or my 'gut'?" @UDubTonyD asked on Twitter. Katmai is home to roughly 2,200 brown bears and claims to have the highest concentration of brown bears in the world. LaValle said the population there is so dense because of concentrated food sources. "Denali or Yellowstone, bears travel farther to find food so there's fewer of them in a given area," he said. The bears feed on sockeye salmon coming from Bristol Bay to the west of the national park. "They've had some record-breaking salmon runs the past two years. This year, I think, it was 62 million fish that came through Bristol Bay," LaValle said. "By and large, if you're gonna be a bear, Katmai National Park is a good place to be one," he said. "The access to food resources allows these bears to be some of the biggest in the world." If a week isn't enough time to get your fat bear fix, there's always the Katmai National Park Bear Cams.